If you have lost an earring or the claws on your rings are looking thin and worn out or if your jewellery just needs a bit of TLC to get it looking its best again, then we can help. Our team of jewellery experts understands the delicate and complex processes of ring and jewellery repairs and is committed to skilfully repair your valuable and cherished jewellery item and return it to you perfectly restored. 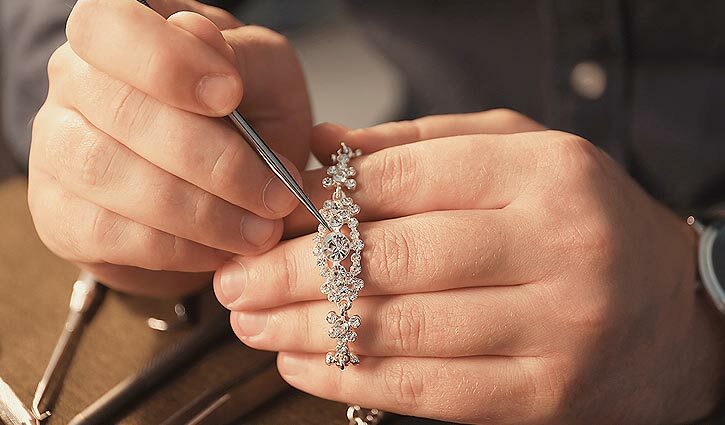 We believe that the repair and restoration of jewellery requires exceptional craftsmanship comprising an intricate balance of old world techniques and modern technology. We have some of the finest craftsmen in Europe on our panel. They are also based in Hatton Garden. They make use of the latest state-of-the-art laser technology. We arrange for one of our specialists to collect and deliver your jewellery who will also photograph your jewellery piece before and after repair. At the time of collection, our jewellery expert will also value your jewellery items and check for any repair work in the settings and fittings on any other jewellery item. We can undertake complete alterations. So, if you want to use the diamonds or gemstones from your old or inherited jewellery, we can work with you to design your new items to incorporate them.